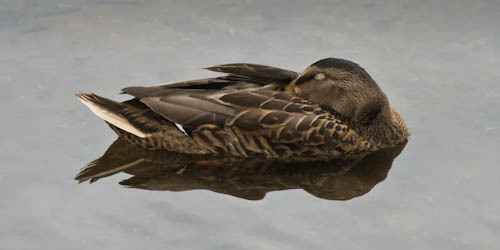 My image, “Sleeping Mallard Hen,” has received the 2011 John G. Mitchell Environmental Conservation Award. I captured this photo in Essex, CT late in the afternoon, across the river from Mitchell’s home in Lyme. At the time, the sight of this duck asleep in the shallows spoke to me about the timeless values of our shared existence along the banks of one of America’s great rivers. It also suggested something about art to me. Only later in the digital darkroom did I realize that the scene stirred memories of seeing Albrecht Dürer’s Young Hare (1502) at the Getty Museum in Los Angeles. A Mallard duck, Albrecht Dürer’s hare, and John G. Mitchell… inspiring company. My photograph of diverse birds – herons, turkey vultures, gulls, ducks, and cormorants – pausing to rest on a river dock, “No Wake,” placed second in the Wildlife Category.